Despite Brussels’ reputation for having excellent seafood, one thing I miss most from my Canadian home is lobster. Say what you will about Maine, Irish or Caribbean lobster, but for me, the best of the best has to be Atlantic Canadian Lobster. After 10 years of being confined to Brussels’ eateries, the whole of the country is now joining in the annual Atlantic Canada Lobster Festival, which celebrates the taste of new season lobster. I learned that for an entire month, Atlantic Canadian Lobster would be featured on special menus of over 50 restaurants in Belgium. I filed this important fact away in my brain for future research and promptly forgot about it. Although I grew up on the Bay of Fundy in New Brunswick, lobster was a rare treat and usually came in the form of a lobster roll which, for the uninitiated, is simply a hotdog roll, sometimes toasted but not always, with lobster meat mixed with a bit of mayonnaise and maybe a piece of leaf lettuce for colour. Fantastic! It wasn’t until I met Andrew that eating lobster became a real family tradition. Growing up, Andrew lived in a small village where the traditional industry was the lobster fishery. 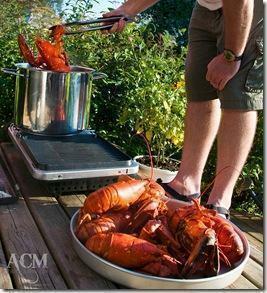 Every summer, we look forward to huge lobster boils with the whole family. It only takes a pot of seawater on the BBQ to steam these delicious bugs. Then we enjoy them in the traditional way – with lobster bibs, nut-crackers, picks, messy-hands and nothing else but some melted butter to dip the meat in. Here in Brussels, I haven’t been overwhelmed with the quality of the lobster I’ve encountered. First of all, it’s very expensive. Back home, we could feed a whole family on the cost of one lobster here. The second problem is that Europeans like to dress-up their lobster too much. On the few occasions I’ve had lobster here, it has been grilled rather than steamed and to my taste the meat was cooked way too much. Besides, half the fun of eating lobster is in breaking into the shell and having a sense of accomplishment when you liberate that juicy bit of claw meat. Fast forward to several days after reading about the Lobster Festival… We found ourselves among friends at Jaloa, a lovely restaurant on Place Sainte Catherine. The six of us were informed that the special menu consisted entirely of lobster dishes. The only caveat was that the entire table had to order it. It wasn’t a hard sell. Our 4 courses of Lobster goodness were fantastic. Despite the fact that normally I prefer my lobster with no muss or fuss, each and every course was done to perfection and the star ingredient was permitted to shine and I didn’t even have to get my hands dirty. Will I go back to Jaloa again for non-lobster fare? Absolutely. 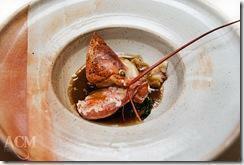 Will I try another lobster menu in Brussels? Possibly, but it will have high standards to attain to compare to Jaloa, and even higher to compare to an Atlantic Canadian patio.